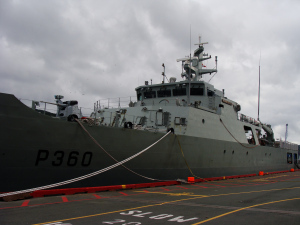 As I mentioned in this week's "Over the Waves", St. John's welcomed a Portuguese search-and-rescue warship, the NRP Viana do Coastelo last Friday. Over the weekend she was open for tours to the public, so I popped down to take a look with Scott Humber of Scott Humber Photography. We were met at the gangway by Vanessa Martins (pronounced mar-teesh), a young cadet of the Portuguese Navy with red hair, freckles, and a contagious smile. She apologized to us for her English and said that she would do her best to give us a tour of the vessel (by the way, her English was better than that of most native speakers I know). The Viana do Castelo is the youngest ship in the Portuguese fleet with just three years in service, while the oldest ships have up and around forty years under their keels. She and her sister ship, the NRP Figueira da Foz, are also the first ships to have been built entirely, from stem to stern and everything in between, in Portugal at the Estaleiros Navais de Viana do Castelo shipyard. The Viana do Castelo serves as flagship to this new class of vessel. The ships were conceived as part of a project that had six ships of this style commissioned; though to date only two of them have been built. They are oceanic patrol vessels, constructed specifically to patrol and protect fishing areas, inspect vessels, respond to environmental crises, and provide coastal support in the North Atlantic. With her 40mm turreted gun, two mine launching systems, and two mounted light machine guns, she carries a lot of firepower for such a small vessel. Her additional naval surveillance systems, observation platform, and water cannons further assist with these missions, as does her occasional accommodation of a Super Lynx MK95 light helicopter. This particular visit to St. John's was the midway point of Viana do Castelo's trip; she and her crew were on patrol for the month of August. While during the rest of the year she is operated by a complement of 35-40 full-time, regular force crew, the summer sees 13 cadets added to the mix. 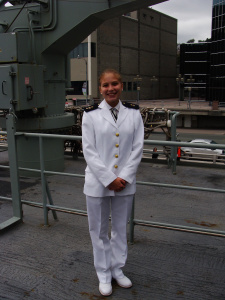 These cadets (such as our tour guide, Vanessa), are all in school, training in various vocations within the Navy. On top of their vocational training, they also do standard Naval training to get them accustomed to all aspects of naval life. Vanessa is in her third year of a five-year mechanical engineering program. With only one mechanical engineer assigned to each ship, she explained, when she graduates she will be given 'command' of her own vessel and will be in charge of making sure that it keeps running smoothly. 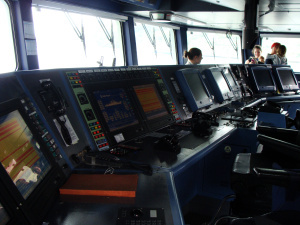 The at-sea summer training is the equivalent of her work term, giving her hands on experience in the engine room and familiarizing herself with the various systems on the ship. The Viana do Castelo has a unique set up in that it has two diesel and two electrical engines. When running on full diesel, the ship can make 22 knots, while electrical can propel them at a modest 11 knots. Other ships in the fleet are either "gas and diesel" or "gas or diesel" equipped, with no electrical engines. By the end of her training, Vanessa will have experience on all of these, which means she can be placed on any vessel within the fleet. 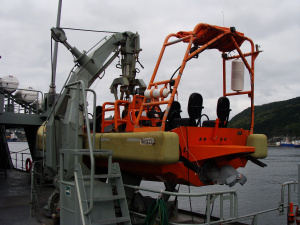 This small boat is used for rescue operations (such as a man overboard). During our tour, Vanessa explained some of the unique aspects of the Viana do Castelo. She has four different types of compasses (laser, magnetic, manual and electronic), as well as a GPS and AIS system, a sonar system, and of course manual charts, all used to make sure that the ship is going in the right direction. This is apparently an issue on the small vessel because even with her stabilizers on her hull, she still rolls a fair bit when she is in rough seas. Vanessa told us a story about a storm they encountered on this mission where the ship was struck by a large wave. Even with the stabilizers on the ship, she still took a fair roll, and some of the crew was quite sea sick. Luckily, there is a small washroom right off the bridge, which many of the command crew took advantage of. The ship is outfitted with three different types of small boats; one is used for rescues (such as if someone falls overboard), while the other two smaller vessels (known as RHIBs) are used for Marine boarding units (there were none on the ship at this time). They also have large floating targets, which look like circular fishing nets with floats. These are thrown overboard and are used by the gunners for target practice (though they aren't official targets; their standard use is for practicing rescue operations. The living quarters are (so we were told) much nicer on this vessel than on other ones; cabins can hold as few as 2 and as many as 8 sailors, while all the officers get their own cabins with private washrooms, a desk, and their own bed. The whole crew on board the Viana do Castelo were some of the kindest and friendliest sailors I have met. They were all eager to speak to us and tell us all about their ship and life at sea. Thank you so much, to this wonderful crew, and we look forward to your return next year! !